How did a 40-something New York City advertising veteran reinvent her life and start a soul purpose revolution in the process? 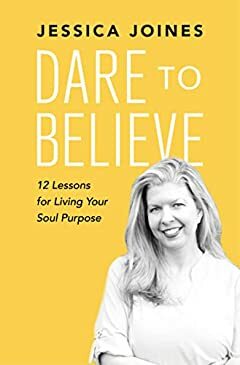 In her new book, Dare to Believe: 12 Lessons for Living Your Soul Purpose, Jessica Joines shares 12 lessons, each with simple, step-by-step coursework that she has leveraged to transform her own life. By 2011, Joines had reached what seemed to be the pinnacle of professional success â€“ but she was also overworked and deeply unhappy in one corporate job after another. To cope, she turned to self-medicating, which contributed to a vicious cycle of despair. Desperate to break the pattern of fear which seemingly dominated her life, she took several daring leaps toward finding what she came to know as her soul purpose. Joines embarked on a year-long solo trip across Southeast Asia, which eventually led to her blissful abandonment of the corporate world altogether. In each lesson, Jessica makes a plea and offers a solution for a new consciousness in which people no longer have to wake up working in jobs they hate, merely trying to get by. She shares her own spiritual awakening story, including recovery from addiction to alcohol and battling the strongest of inner demons, as a profound and universal guidebook. Having defeated the false perceptions that plagued her after a long struggle, Jessica has proven to be a humble teacher. Her debut bookâ€™s core lesson is that of breaking through the illusion of fear and aligning to love. With an honest, vulnerable yet straightforward approach, Jessica reveals the specific, actionable spiritual lessons that have helped her discover what she already knew at the soul level: We are never destined to suffer. We are here to pursue our dreams. Unique to typical spiritual reads, Jessica works to break down complex and esoteric spiritual principles into simple, easy to understand lessons, each with step-by-step plans of action. The result is â€œDIY courseworkâ€ thatâ€™s not only practical, but life-altering. These teachings are accessible and easily adopted by people from every walk of life. For more information about upcoming classes, coaching and events, visit Jessica's website. "Women and Men of and on Purpose is what the world needs in spades in these awakening times. Dare to Believe is that simple, no-nonsense, practical step-by-step guidebook that will help you uncover your soul purpose through authentic and effective practices and tools that Jessica has lived and applied herself and now shares with successful leaders. May this book do great amounts of good by setting many people boldly forth on their purposeful journeys." - Steve Ahnael Nobel, Author of 'Starseeds', Ascension coach and Soul Matrix Healer.